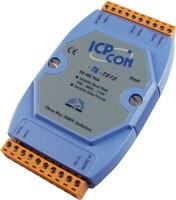 The I-7513 is a 3-ch RS-485 Active Star Wiring Hub. The unit has three independent RS-485 output channels, each with their own driver, which can transmit signals across 4,000 ft (1200 m) of cable on each channel. The I-7513 includes both Hub and Repeater functions, so each output channel can be connected to another hub. The isolation site of the I-7513 is located in the input and output interface circuit. In other words, the I-7513 is a three-way isolation module.